A controlled technique for relieving dies before wax-up, by alternating coatings of gold and silver colored liquids over the die for uniform coverage of 25 microns space. Each coat is aproximately 6 microns. 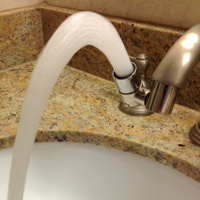 Liquids are fast setting. 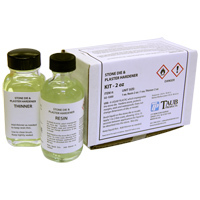 Use on stone, amalgam, plated or epoxy dies. It is a high spot indicator. Tru-Fit's gold and silver colors can be used as a visual aid on models for patient education. Gold solution can be used to simulate crowns, inlays and bridgework. Silver solution can be used to simulate amalgam restorations, partial denture framework. According to studies at a leading university, precision castings will not seat, be as much as 200 microns, unless relieved. To provide adequate space for cement and common internal discrepancies for ALL crowns and inlays, four coats of fast-drying Tru-Fit will provide much better marginal fit by allowing castings to seat more completely. Tru-Fit also greatly reduces the need for occlusal adjusting. 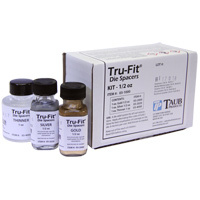 Tru-Fit is available in a variety of sizes for kits and individual components. The item list below will give sizes and Item #'s for ordering. 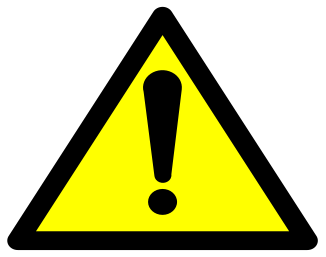 WARNING - This product can expose you to Toluene, which is known to the State of California to cause birth defects or other reproductive harm. For more information go to www.P65Warnings.ca.gov. - Wets the surface of the die allowing close contact of the wax to the die for greater accuracy of the casting.